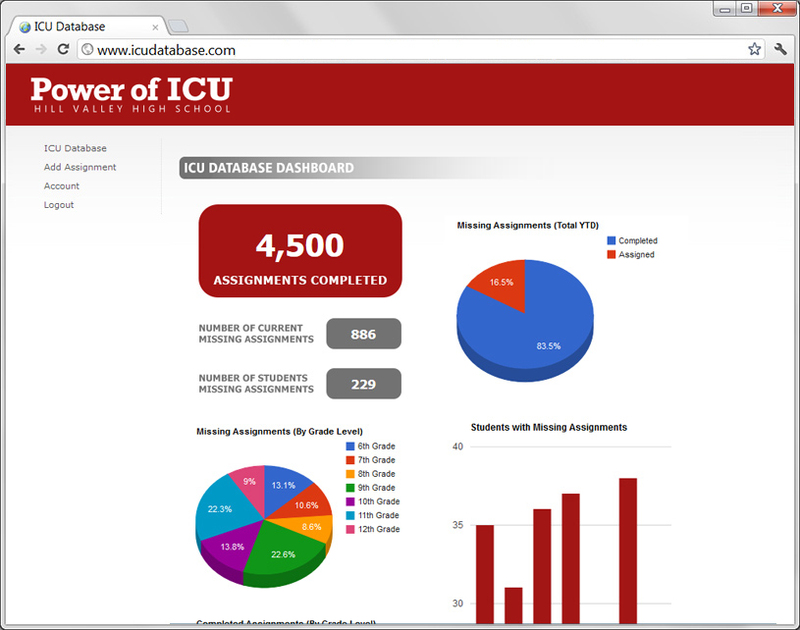 The ICU Database is the supercharged “ICU list” used by schools across the country who are implementing the Power of ICU’s “Proven Formula for Student Success”: Completion + Quality Assignments + Healthy Grading = Student Success! The ICU Database is web-based, so teachers can create, monitor, and manage missing assignments with ease. 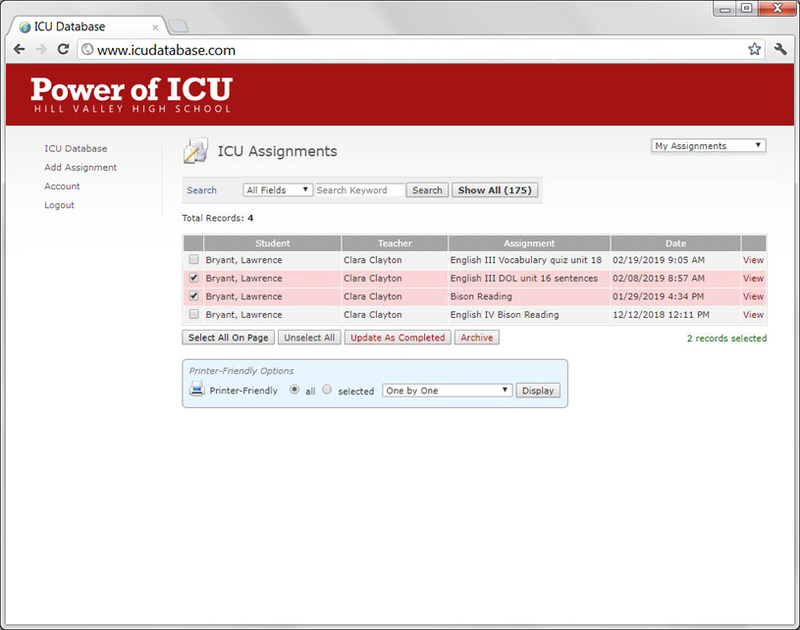 The ICU Database is web-based, so teachers can create, monitor, and manage missing assignments online anytime from any computer with internet access. 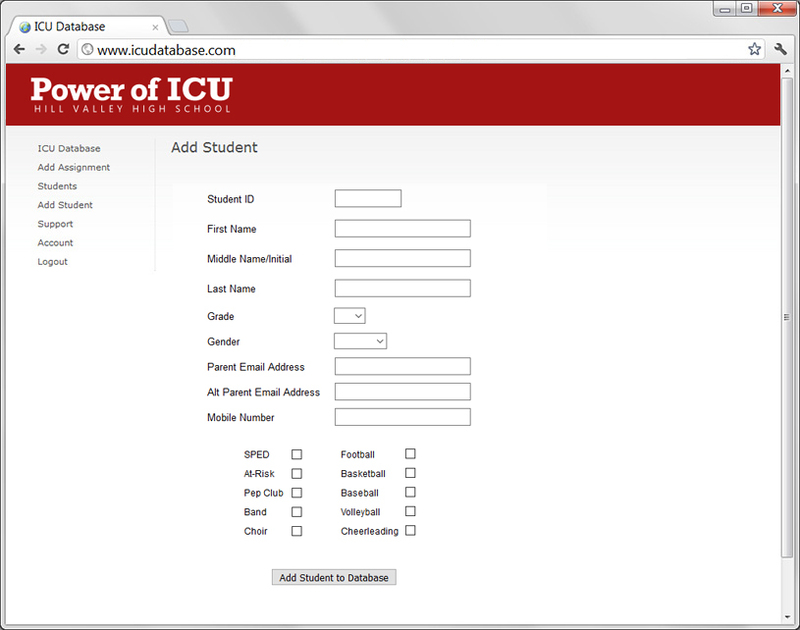 Each teacher has their own username and password for easy, secure access. 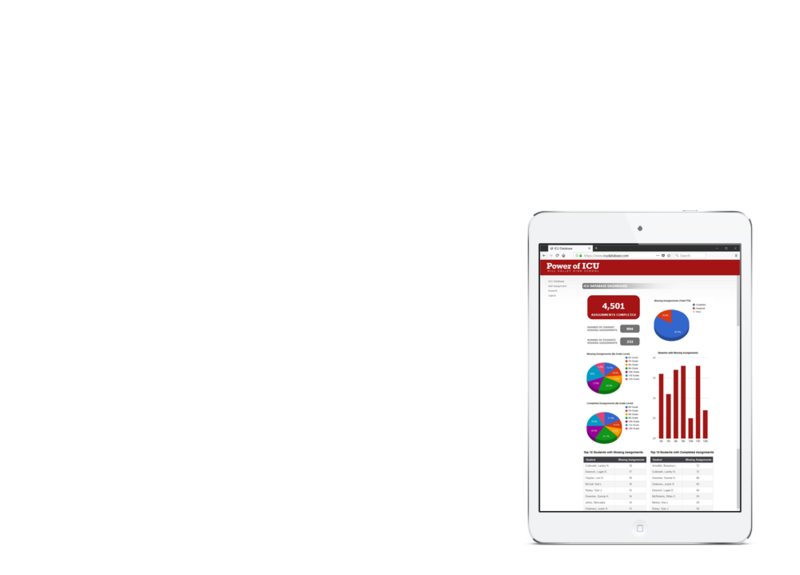 The database dashboard shows real-time, school-wide missing assignment data, including charts and graphs of completed and missing assignments, grade-level breakdowns, entered/completed histograph, and student/teacher top-ten lists. 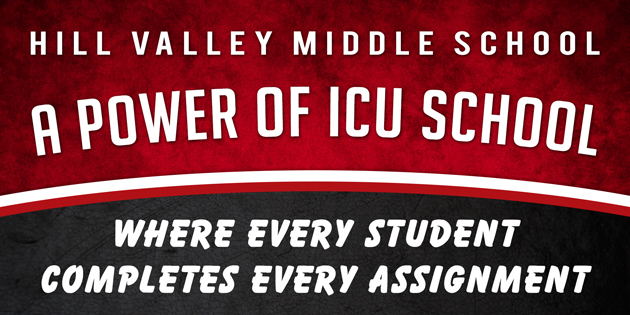 When a teacher puts a student's missing assignment on the ICU list, parents are automatically texted and emailed a notification of the missing assignment. 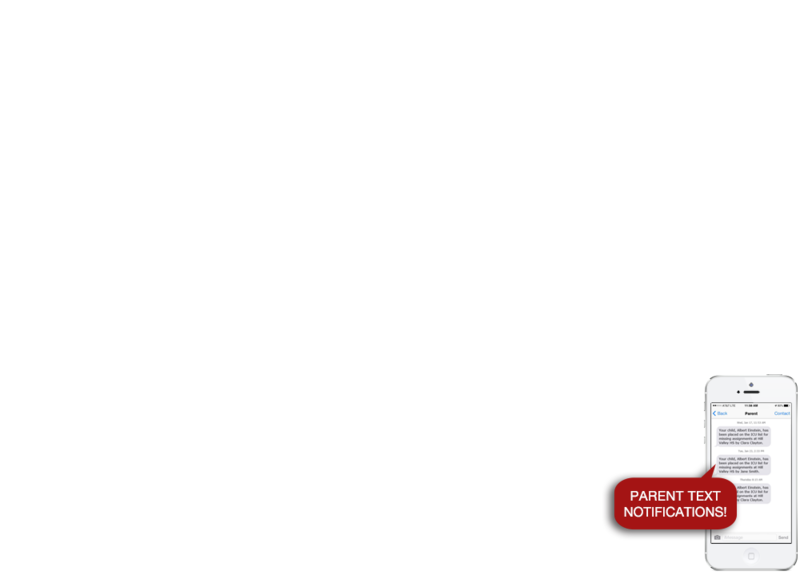 The email includes any specified comments or attachments from the teacher. 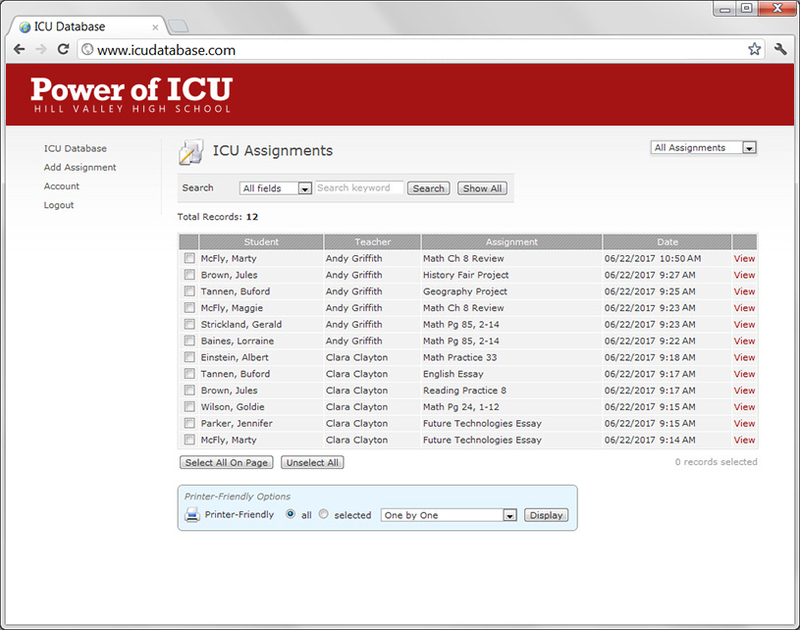 Students can be grouped together and viewed in "filters" (school groups, clubs, teams, etc.) so every adult (from interventionist to football coach to band director, etc.) 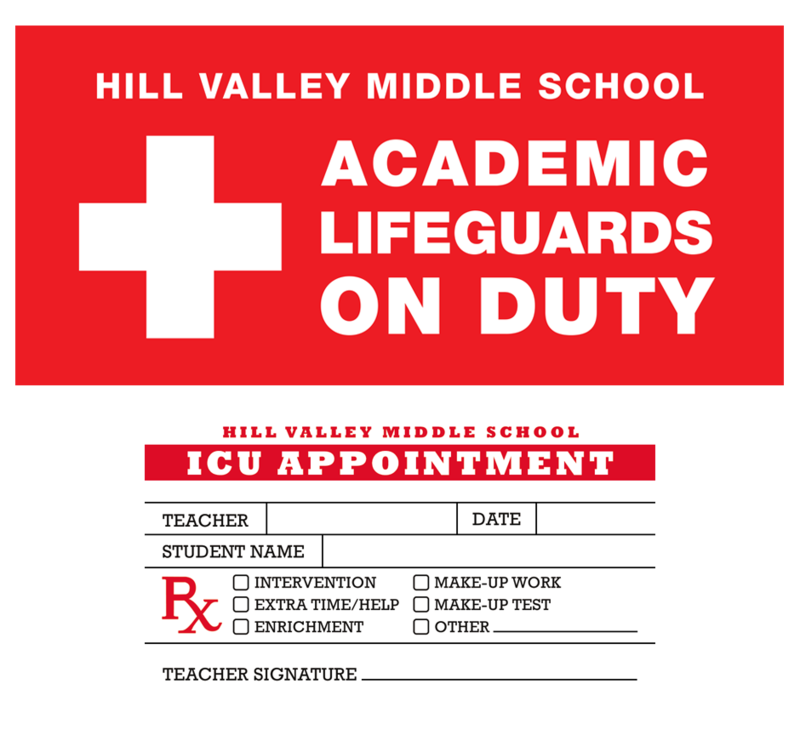 can become involved in reviving student engagement and responsibility. You send us a list of teachers and students, we do the rest! Our support team is ready to assist before during/setup and throughout the year. 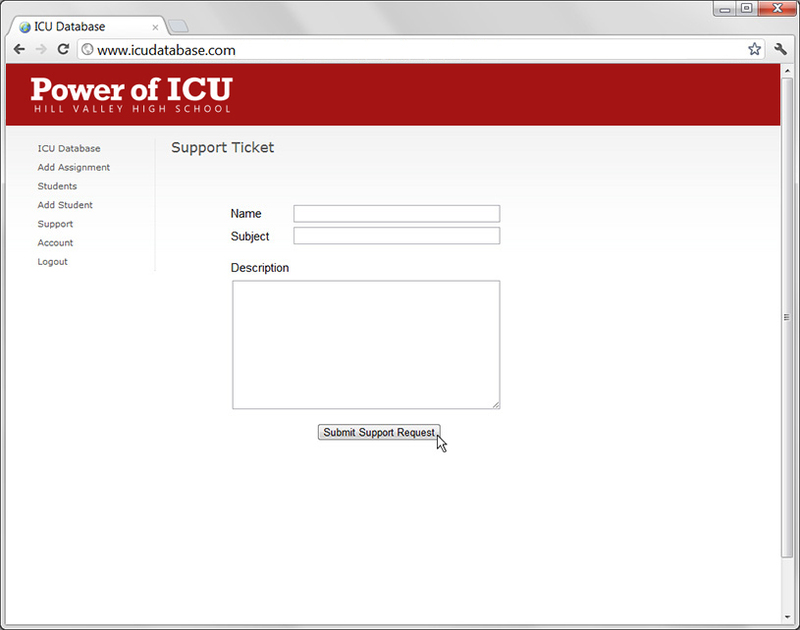 Because the ICU Database is web-based we can provide remote support and make adjustments for you on the fly. Every school is different! Looking for tools and resources to help in the fight against student apathy? Connect with other ICU schools from across the country to learn different strategies and ideas for building layers of support that work for you! 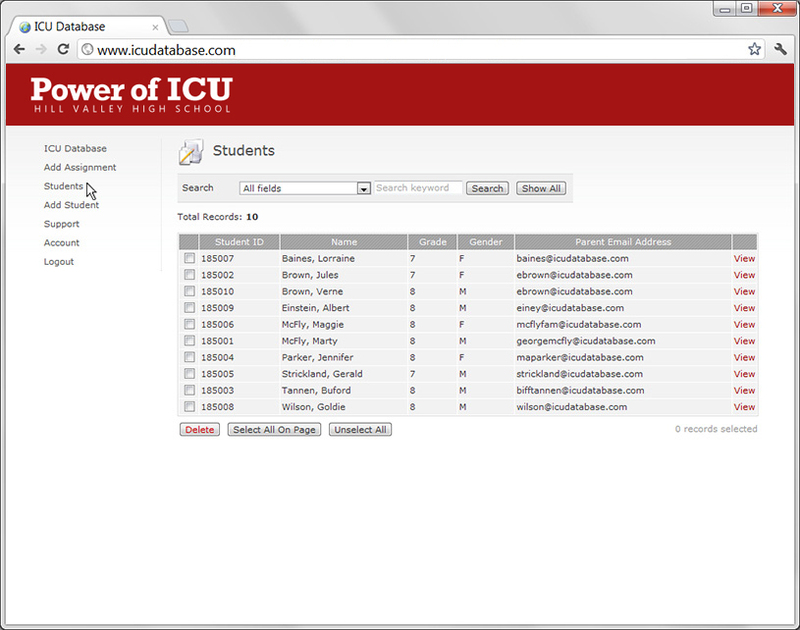 The ICU Database has been the 'game changer' for getting everyone on board. The response from parents and students has been amazing. The assignments have been rolling in. Communication is not only between the teachers and the students, but also with coaches, administration, and most importantly the parents. It’s a chance to address academic issues quickly and in a timely manner so that other educational gaps do not arise. We knew we had an apathy issue, and we would have made ourselves crazy tracking down everyone who didn't want to get on the bus. This way, we are hyper focused on which kids to track. 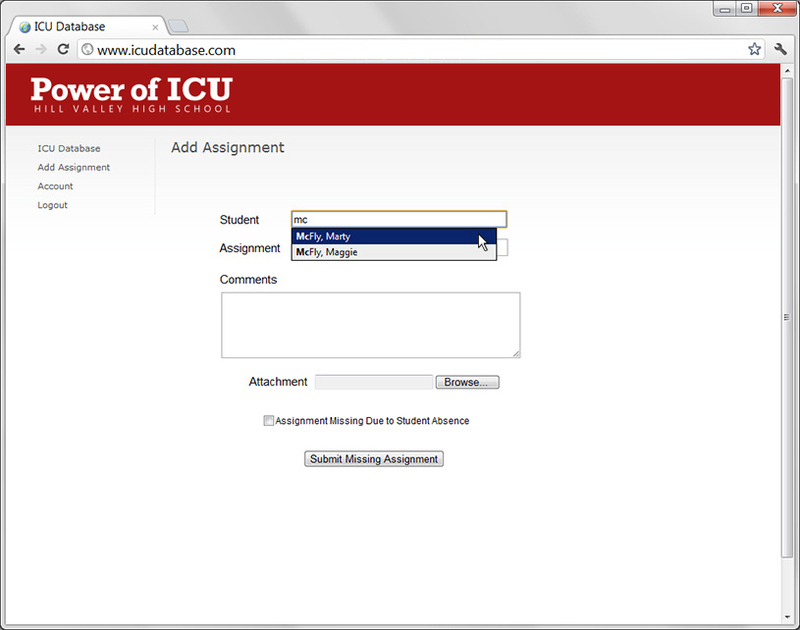 ICU is going very well. Our teachers really like it and our parents love it. I have received nothing but positive feedback. 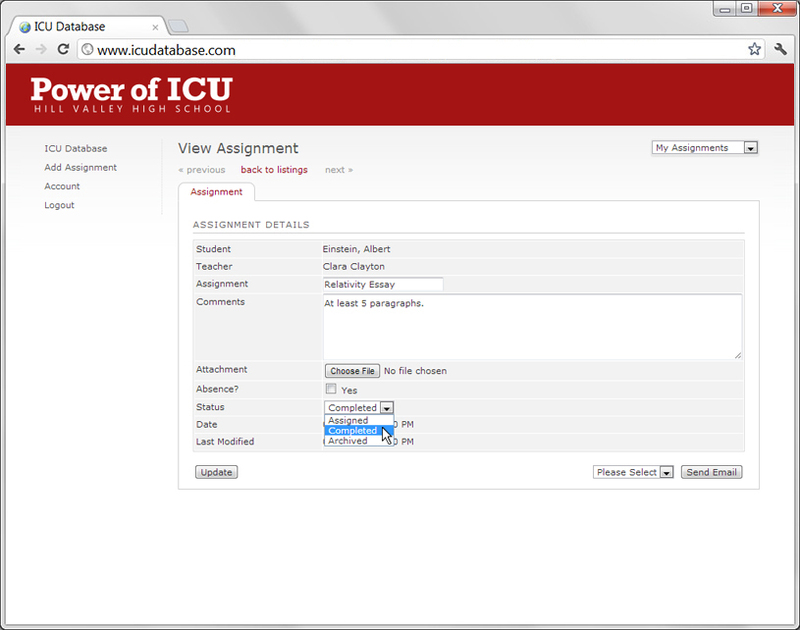 Our students have now completed 1,142 assignments! 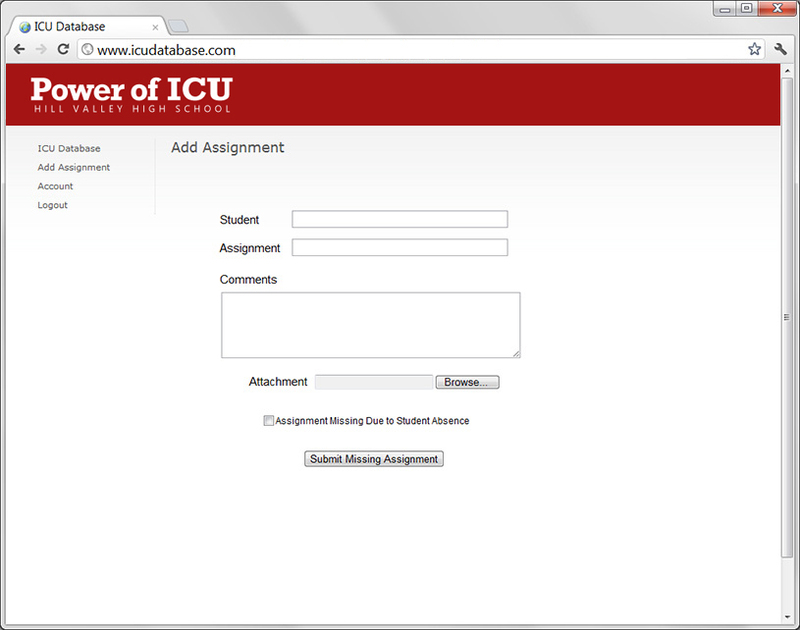 Launch the demo database, and use the credentials listed here to browse through a live version of the ICU Database. 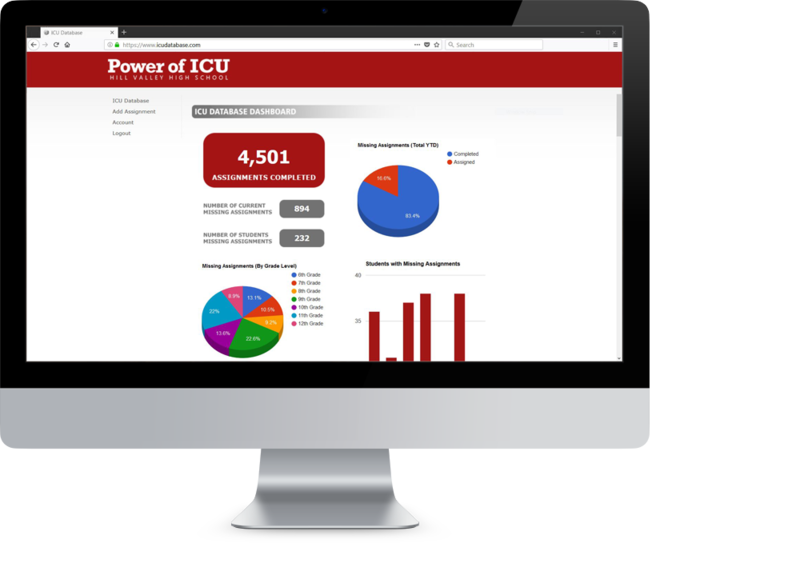 The setup and support of the ICU Database is combined into one fee of $1,999 for an initial year, and an annual support fee of $999 is billed each year thereafter. Text/SMS notifications are included. 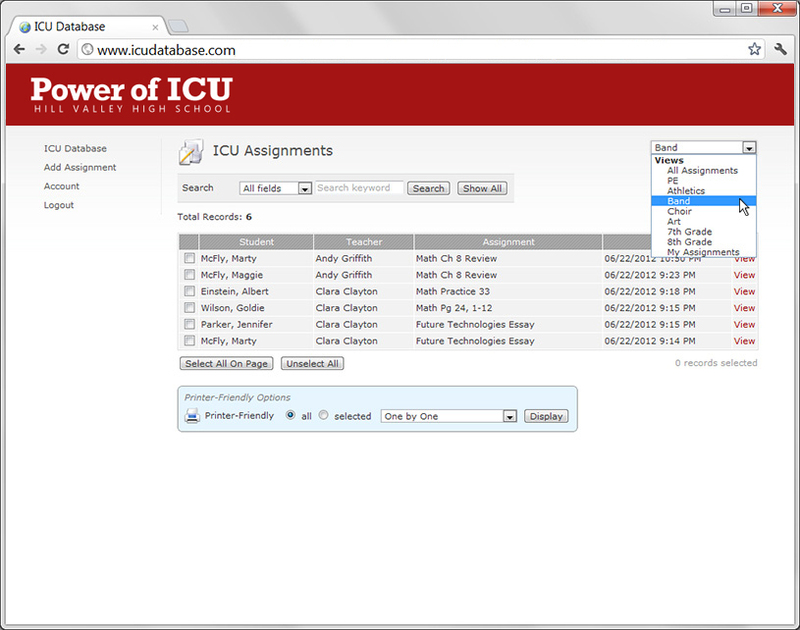 Add-ons for special, extended features are also available (priced as listed).